Basic block callback to detect "switch" statements. 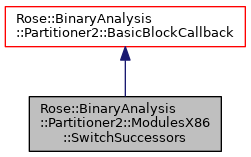 Examines the instructions of a basic block to determine if they are from a C "switch"-like statement and attempts to find the "case" labels, adding them as successors to this basic block. Definition at line 95 of file ModulesX86.h. Definition at line 97 of file ModulesX86.h. This is the method invoked for the callback. The chain argument is the return value from the previous callback in the list (true for the first callback). The successor callbacks use chain to indicate whether subsequent callbacks should do anything.